Thanks for joining us in Bilbao! Thank you to all those who came to ECIO 2017 and to those who tuned in through our live and on demand web page! This congress was a huge success and we hope you gained a lot of valuable information and insights. If you missed any sessions or would like to revisit a topic, all presentations are available in the CIRSE Library and from there you can re-explore highlights of the programme. Also keep an eye on our YouTube Channel for a soon-to-be released video with highlights from this year’s conference! You can find your certificate of attendance under the “myCIRSE” section of the website. Thank you again for joining us, and we hope to see you next year in Vienna! 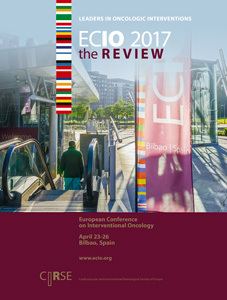 We spoke with delegates to find out why they came to ECIO, what their highlights were and what they think of the European Conference on Interventional Oncology. We hope you enjoy! Print out your certificate of attendance or watch all presentations in the CIRSE Library. ECIO 2017 was featured in numerous Spanish online media outlets.